If you are experiencing an unexplained pain in your shoulder that remains agonizing, then fear not. A likely cause for this is having a pinched or trapped nerve in your shoulder. This article will explain how this can happen, and how it’s treated. What’s a Trapped Nerve in Shoulder? A trapped nerve occurs when compression, or pressure, is applied to a nerve. This can be a result of numerous things, including repetitive motion. It can also occur when you keep your body in the same position for extended periods of time. Various other things can cause a nerve to become trapped, including, but not limited to: incorrect posture, aging, heredity, obesity, and injury or trauma. Trapped Nerve in Shoulder: What Are The Symptoms? If you are experiencing one or more of the symptoms mentioned above, then a trapped nerve could be the cause of your condition. Ice therapy is often offered to treat acute aches and pains, those that are often associated with a trapped nerve in shoulder. This type of therapy helps to reduce swelling and inflammation in the affected area. It also helps to anesthetize and numb the affected area, lowering the pain and tingling sensations that you may experience. Rest will ensure you do not over exert the injured shoulder. Simply stand with your affected arm pointing in front of your body, and ensure that your elbow is not bending. 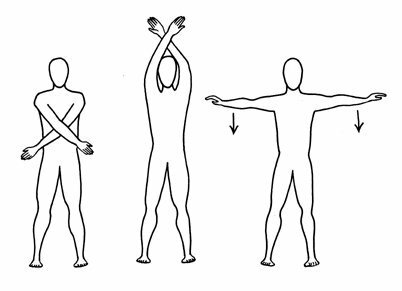 Next, extend your affected arm slowly away from your body, outwards, either left or right. 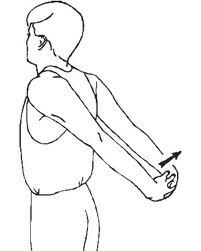 Then place your affected arm at your side and slowly raise it behind your back. Finally, perform a full rotation of the affected arm from a relaxed position at your side, raising it in front of your body, round over your head, and back to resting at the side. This motion is best performed at a slow pace to not risk intensifying the injury. Relax, and repeat as necessary. First, stand up straight with your shoulders back and relaxed. Then, grasp both of your hands together behind the lower part of your back. Note that if you are having trouble performing this action, then hold onto a graspable item, such as a rolled up towel, that is positioned horizontally behind your back. Next, lift your hands outwards and away from the body, whilst keeping your elbows straight and maintaining an upright position. Ensure to stretch for no longer than 30 seconds. A shoulder blade squeeze can be performed either sitting or standing. First, check your posture and ensure that your back is straight, then simply squeeze your shoulders together, hold (for a few seconds), relax, and repeat 5 times. 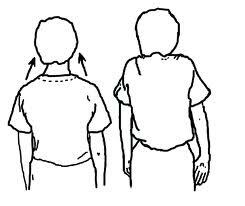 A shoulder blade shrug can be performed by standing up and ensuring your back and neck both remain straight. Next, place both arms at your side, with your palms facing outward. Finally, raise your shoulder blades upwards toward your ears. Hold for a few seconds, relax, and repeat 5 times. Chin extensions – This exercise be performed sitting down. Simply interlock your fingers and place your hands on the back of your head, for support. Next, slowly rotate your neck until your chin touches your right shoulder, and hold fore around 10 seconds. Finally, repeat the routing on the left side. Bench press – This is an exercise often performed to strengthen and enlarge one’s pectoral muscles. For trapped nerve purposes, it is most advised to avoid the use of weighted barbells when performing bench presses. Simply utilize a broom or similar object. Lie on a flat surface, holding the broom with both hands about shoulder width apart above your head, raise the broom up above your head by extending your elbows outwards, and hold for around 25 seconds. Anti-inflammatory medications are often used to reduce swelling around the affected nerve. Your doctor can also provide you with a corticosteroid injection in the inflamed area, if you are experiencing severe pain. In rare cases, if the condition does not improve after numerous months, then surgery may be performed to correct the problem. Although these measures will not guarantee the prevention of injury, it will most certainly help. How Do You Pop Shoulder Properly? What Causes Numbness in the Left Hand? Why Can't I Remember Things?